Momentum Sound & Media, LLC values relationships, quality, creativity and integrity above all else. Our team is driven by a desire for excellence and your ultimate satisfaction. We offer systems and features at all levels from home entertainment to complete home automation.Our approach to system design and the clients we serve is unique. We make sure that each part of the overall design meets our criteria for performance and integrity. We tailor each feature to our client’s lifestyle while ensuring ultimate performance. This allows us to offer a system that is truly reliable, easy to use and has excells in all performance parameters while being ready for anything new that comes along in the future. A clear, concise understanding between architects, interior designers, engineers, construction professionals, facility managers, and owners is key to completing a successful project. To be on the same page you havens be in the same book, or in the case of a construction project, the same model. That’s why we start with careful drawings and then monitor each step to be sure they are executed with precision. From the first encounters, to weekly meetings, to being available on short notice, we act as your Electronics Project Manager through the entire process. 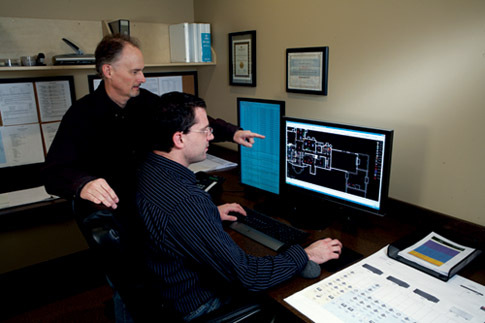 We instruct, coordinate and monitor everything to be sure the job is done right the first time. Testimonials Contact us today ! Copyright © 2016 Momentum Sound and Media LLC, all rights reserved.